Otherwise known as ladybird, or lady beetle. Or golden knop, or freyjuhena, or bishy-bishy-barnabee - it depends on where you're from and whom you've named it after. The Norse goddess Freyja? Saint Barnabas? If you opt for "ladybug," you're alluding to "Our Lady" Mary, whose red cloak and seven joys and sorrows correspond to the bug's red shell and seven spots. A fool, according to Epicurious.com, is an old British dessert where fruit purée is folded into whipped cream. This one, made with rhubarb, is seasonal, quite easy and extremely good. How do you get ladybugs to live in your garden? 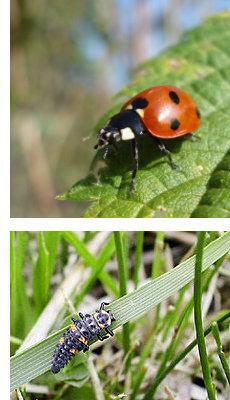 Ladybugs don't just eat aphids, of course. They eat other soft-bodied sap-suckers too, and pollen - an important dietary back-up for when the pests aren't so numerous. Which of the following ladybug facts is not true? B. They can bleed at will.